Will the DOE's Digital Promise Reach Every Student? 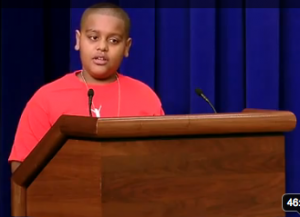 Seventh-grader Josniel Martinez, leaned toward the microphone and spoke clearly. "I did pretty well in elementary school. But it was hard for me to accept that as a sixth-grader, I had more responsibility and more homework….at my new school in East Harlem." He paused. "And if you didn't hear me, I said East Harlem!" His audience, which included at least one U.S. Congressman, a number of people who measure their net worth with at least seven digits and the U.S. Secretary of Education, Arne Duncan, heard him. Last Friday, the group gathered in Washington's grand federal building, the Old Executive Office building, to kick off a project that literally germinated around the same time that 11-year old Josniel was born: a non-profit organization to help shepherd digital technology into classrooms. And Josniel's story was the thread that wrapped all those hopes and ideas together. Named Digital Promise, the group has a modest dowry from the federal government and an ambitious agenda: To advance technologies that can transform teaching and learning. Using technology to power learning still provokes plenty of debate -- but not in Josniel's home. At the Digital Promise kickoff, Josniel described how he started to fall off track in middle school. "Just imagine this: Your boss sends you a letter saying, if you don't work hard enough you're going to be fired. Now wouldn't you want to roll down on the floor, start crying, saying Noooo!" recalled Josniel. "I did," he added with a nod. It took a village -- a digital village -- to get him back on track. The nonprofit, CFY, provided access to Power My Learning, which has games for practicing academic skills. Josniel's mother made sure he used the site regularly and cut his television time. The teachers and principal at his school, pitched in, too. The digital technology, Josniel said, enabled the people around him to collaborate -- and he wound up acing his tests and feeling in command of school. Coincident with the kickoff of Digital Promise, the Council of Economic Advisers released this report describing why innovation has been slow in ed tech. It fingered two key culprits: a fractured marketplace that makes selling innovative tools challenging and a dearth of "credible" and independent evaluations of most educational technology products. "Traditional evaluations of educational technology products are both time-consuming and expensive, and many educational technologies have received no external assessment," the report states. Helping schools experiment with technology, share their experiences and collectively articulate their needs to industry--through venues such as the fledgling League of Innovative Schools. Bolstering advanced research--through programs such as National Science Foundation's $15 million cyberlearning initiative. Supporting research on effectiveness, through studies conducted by the likes of the Urban Education Lab (led by the University of Chicago's Urban Education Institute). Encouraging development, such as by supporting the 2012 National STEM Video Game Challenge (which awards prices to students who develop cool science and tech-related video games) and a challenge to create new levels of Portal 2, a puzzle game. Digital Promise is also convening a "commission" of industry leaders to help it chart its research and development and policy initiatives. Most challenging may be finding funding. When the idea was broached more than a decade ago by Lawrence K. Grossman, former president of NBC News and PBS, and Newton Minow, former chairman of the FCC and PBS, they had hoped to channel federal revenues from licensing or selling electromagnetic spectrum into spending for digital tools for schools. Now the nonprofit will seek support from private foundations and philanthropists. Those gyrations don't mean much to Josniel, who has his eye fixed on a different horizon. "Now look at me in 10 years, Secretary Arne Duncan," Josniel said, wrapping up his speech. "Because I'm going to college, and maybe even work for a President. And maybe one day, you'll be working for me." Rock on, Josniel. Betsy Corcoran is cofounder of EdSurge, a free weekly newsletter on educational technology. A similar version of this story appeared on EdSurge.